Rotrex questions - Miata Turbo Forum - Boost cars, acquire cats. I just recently became aware of the Rotrex superchargers. it seems pretty ideal for my needs. This is my nice weather cruiser and autocross car. My local autocross sites are both insanely gravelly and traction limited. Several other turbo miatas have hell trying to deal with the more sudden power delivery of a turbo. I've read all the things I can find about the rotrex, i even called jackson racing today and still can't get all the answers I'm looking for. If I understand it correctly, these things build boost linearly with how fast they are spun. I asked what ultimate PSI the standard 30-74 was of, and the guy at jackson racing said 10 psi, this seems low vs some of the threads I've read. Is this truly the PSI limit? Second, the guy said you gear via pulleys to develop whatever your target PSI is at redline. why can't you spin it faster, build up to your target boost level earlier then bleed off the excess pressure so you can get to max boost prior to redline? also, almost all the kits i saw had a HP at 160-180 on 7 psi. I'm assuming this is where the stock injectors/stock computer run out of room. With big injectors and a megasquirt is the 74 capable of 240 hp? also, I've seen some kits that offer optional 30-94 upgrades, the rotrex site lists a 30-84 that's splitting the difference and from what i can tell would be right at what i was hoping to get, is there a reason these aren't used? I don't think you'll get to 240 on the 74... read Mobius' build thread- he is making something like 230 with a cnc head and lots of $$$ spent. I think I'm around 180-190 (at altitude). The blowers seem to make less psi than rotrex claims. I think everyone is spinning them as fast as possible but not quite getting the boost they should. If you want to get 240whp easily out of a rotrex, get the big one. These things are rpm limited. that means if you want more than 200 get a bigger one. Boost can be changed based on pulley diameter. The supercharger is rated for a top shaft speed which can not be exceeded. For the power levels your looking at your probably best off holding out for this kit that's in development now. I'm not sure who I talked to at jr, maybe I wasn't clear in my question, but I think it might have been someone besides whoever posted here and developped the kit. Is there somewhere that you can find air moved at what pressure for charger rpm? Playing with Pully diameter & restrictors will allow you to profile the boost but ultimately there is a max RPM for the input speed. Awesome the compressor maps are what I needed . What's the stock na8 crank pukley diameter? God ******* damn this sites timeout! Had a ******* great post. **** this ****. The planetary drive on the ****** allows compressor wheel to turn at 9.49 x input shaft rpm, which allows turbo-like compressor wheel rpms without blowing apart the center section. This higher RPM allows for turbo-like efficiency. What it does not do is build boost as quickly as a turbo because it still shakled to RPM. the planetary drive is not a cvt deal, so that's a fixed 9.49:1 ratio. or B) running the big old 94 at a safe rpm, but possibly operating out of its efficiency range in terms of pressure ratio. AFAIK the 94 is designed to run higher pressure and high volumes and below that is sort of lazy compared to a 74. I am now too frustrated to look at the map and figure it for myself. I would not be surprised if you had the ability to put yourself 'below' the efficiency island on that map by running the EWG. Also, you better have the EWG tuned well. They work great when they are actuating based on boost and bypassing exhaust gasses. But actuating based directly on the same pressure they are impacting may mean that you get some weird feed-back loop type issues, as in fluttering the crap out of it and breaking springs. There's no engine/combustion buffer between signal/response/impact if that makes sense. Its all intake pressures. So it sees target pressure, open, immediately sees the pressure drop it caused, closes, immediately sees the pressure go backup, etc. A restrictor on the outlet of the EWG may make a world of difference here. I will answer this part, because the answer is Yes, you can do that. Lets say you have an ultimate goal of 10 psi. Naturally you would install whatever the 10 psi pulley is, and see that somewhere around redline, with less boost through the RPM range. What you can do however, is install say a 12-15 psi pulley (for the sake of example) and a wastegate with a 10 psi spring on the cold side intercooler piping. What this will do is spin the blower harder, making more boost, until it reaches the desired 10 psi to pop the wastegate. What you end up here with is a MUCH fatter midrange compared to a normal centrifugal blower powerband. Now, this is not without its drawbacks. You're spinning the blower harder, so it obviously is seeing more heat and could be more prone to detonation. This also creates more torque, and the miata motors are not the most robust things to begin with, so a lot of times the lower torque is actually welcomed for the horsepower levels they achieve. You can only overspin til you reach the posted rpm limit of the blower. You can spin past it, but it can also blow up or damage itself past it. This is similar to what I'm planning for my car. Rotrex c30-94 driven to a higher PSI then a EWG to control max boost as well as future options like boost by gear etc. I don't want crazy high midrange torque as then I'm loosing the driveability of the linear power delivery that the rotrex provides. Also moves into the range of gearbox issues etc. 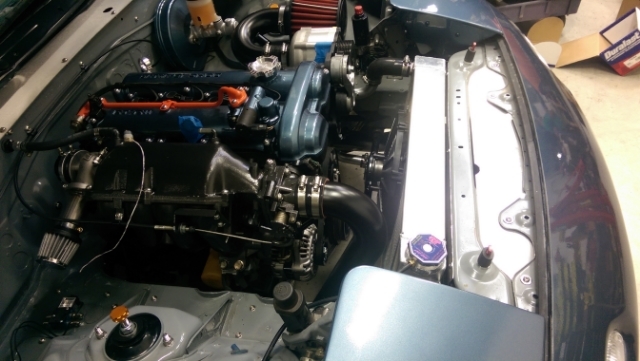 Jaydee has a post on the K20a.org forum where he is running twin Rotrex on a K24 engine for over 650 HP. He has gone through a lot of issues with the EWG and ended up sizing it smaller to control the over venting issues. It's a very long thread but well worth the read if you interested. Im just waiting for the Jackson Racing kit. If I can achieve 300hp with a mildly worked head, stock cams, and forged internals, I will be happy. on e85 or 91? That's a big factor. I want to know what the new jackson racing kit can make on 91 octane and stock engine. We have not been able to start testing it yet. We had an issue on the dyno that cost us an engine. I just got done putting a new one in and hope to start and break it in in the next couple of weeks. I plan on doing a small amount of e85. In my speed3 I use about 29% e85 and it provides plenty of timing without detonation issues. I really don't blame him for asking. Claims are different everywhere, and compare what Möbius made with his 74 tapped out with what Deviate made and they're not even in the same ballpark. I'm quite confused as well. Deviate's engine alone made 170whp so at 300whp the rotrex added 176% power. Compare that to a stock BP making 110 whp and you get about 195whp with rotrex. Not the best way to look at it because the difference between e85 and 91 octane various greatly when FI is added but it's just one way to look at it. I'm still waiting for dyno results on a relatively stock bp with the jackson racing rotrex kit on pump gas. Oh. Added 76% more power. And here's the dyno you've been looking for, and incidentally, it's exactly where you guessed it to be. Edit: OK it's not the JR rotrex kit, but it's a rotrex on a relatively stock NB. Almost completely stock NB BP6D.